Rocky. He came with the name, and it fit him perfectly. How old is Rocky? Anyone's guess! Probably close to 14 years old. Rocky was pulled from the shelter Memorial Day weekend 2005. Happy 13th Gotcha Day, Rocky! Rocky initially came from the City of Buffalo Animal Shelter where he was surrendered. Then, he was the first official Pound Hounds & Friends, Inc. foster dog pull. He was very, very scared and was at risk of not getting an adoption card, so we begged to take him with another foster pull that day, and thankfully the power that be agreed. I was brand new to rescue at the time. Rocky LOVES Pillows. He rests his head on anything he can. Coffee table, kitchen chair you name it. He also sits on the stairs like a person and stares out the big front window from afar to watch the block. One super funny quirk is he takes the empty dog food can (we used to leave in sink and hop up put head in sink and take it) and run away with it hanging out of side of mouth to living room then lick clean. Now we put on floor for him because of his legs. Chasing squirrels was his pastime. He even climbed a tree when we tricked him with a stuffed squirrel. He also jumped 6' privacy fence multiple times chasing a squirrel. Favorite Toy: Mr. Moose! Can we talk about Mr. Moose? Mr. Moose is a stuffed animal from Ikea that Rocky took from on top of the fridge which was purchased for his human cousin. Yes, I did say on top of the fridge. He used to jump on the counters. Mr. Moose went with him to both adopting homes, and came back with him. Mr. Moose is Rocky's comfort toy. He leaves it on the second floor and when he is in a mood, he runs to the room upstairs, grabs Mr. Moose and shakes it. Mr. Moose has also gone to Grandma's for "surgery". Mr. Moose has also made an appearance on the Christmas card. Favorite Treat : Pepperoni. It comes in the magical square box from his humans. Basically, any treat or food. Likes: Food, pizza, treats, loves his people, and knows everyone he has met, walks, rides. Dislikes: Loud voices, bicycles, people on roller blades, veggies. He spits out veggies. Favorite Activity to do with his Parents: Walks, Snuggles, and a game we call Choo Chooo. This is when we run around the house holding a stuffed toy behind and he has his mouth on it, and we make choo choo trains sounds. I get it, we are the crazy dog people running around the house with our dog in tow. Rocky is my Soul Dog. He has been by my side and as loyal as can be through all the ups and downs. We know he has had his challenges over the years and could be a bit leash reactive, kicked out of two obedience classes. But, he is my love and he is also the first dog my husband got to experience (our others passed away). He wears his emotions on his face. 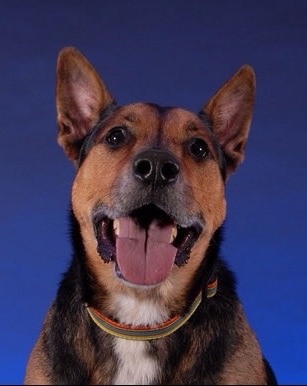 Rocky has also been on the jumbo tron, in commercials, and on posters to name a few. He has been a great brother to many foster dogs over the years, too and he loves when they come to visit to play with him. When I traveled out of state for two years, he fell in love with his second momma Veronica who watched him and loved him weekly until I got home on weekends. We know Rocky is aging, but life is better with him. Soul dog times a million!